Clockwise from top left: Cooked converted white rice, cooling rice, packaged rice for the freezer, cooked brown and wild rice mixture. One of my favorite foods to prepare in my stove-top pressure cooker is rice. It comes out perfectly…with no concern about scorching or sticking. 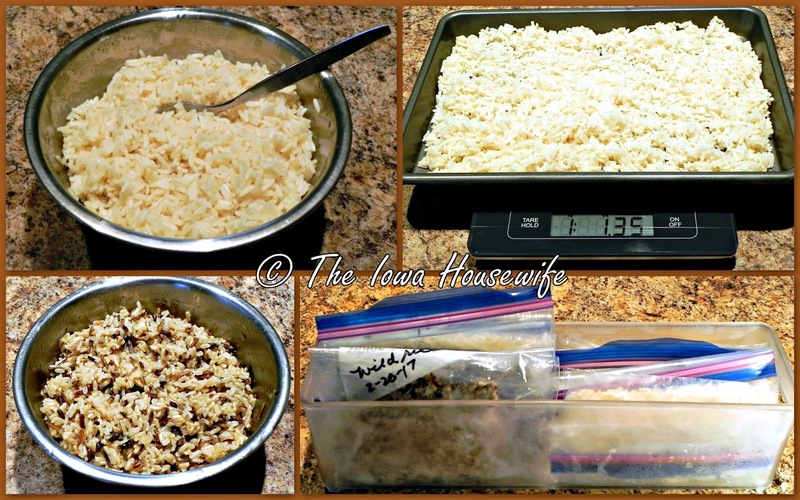 I freeze rice in meal-size packages for us; it saves me a lot of time and fuss at mealtime, if I’m stir-frying something at the last minute I don’t have to watch rice too, or I have a quick last-minute side dish. I simply microwave it in a covered pyrex dish or measuring cup a couple minutes until it’s hot, stirring after each minute…the time varies by how much I have and whether I thawed it or not. Clockwise from top left: Steamer insert for Presto pressure cooker, wild rice and water ready for cooking, foil covered bowl in PC, Stainless steel 6 quart Presto pressure cooker. 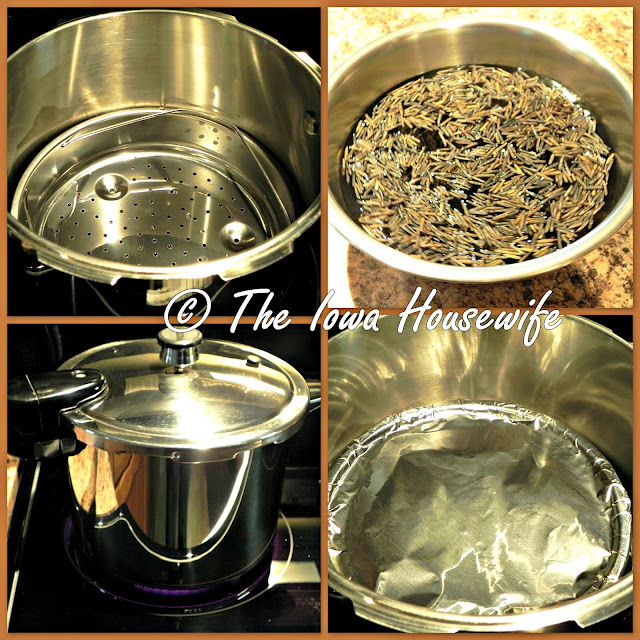 I use an inexpensive stainless steel bowl that is about 1 ¼ quart, that fits perfectly, and has a nice lip to attach the foil to, and set it on the steamer insert I bought from Presto for my 6 quart pressure cooker. This method works just as well in an instant pot. Just set your covered bowl on a rack, set your pot to "pressure cook" on high. Follow the regular pressure cooking directions. Notice that the wild rice calls for more water in the bowl than brown or white rice. I use converted rice (like Uncle Bens) or long grain rice. I spread the rice out on a rimmed cookie sheet to cool it before packaging. Combine rice and 2 cups water or broth in 1 1/4 quart stainless steel bowl. Cover tightly with aluminum foil. Add cooker lid, put on weight, bring to pressure. Time for 20 minutes, lowering heat to keep pressure weight just jiggling. Let pressure go down of its own accord, about 15 minutes. Remove pressure cooker cover and let steam about 5 minutes, still covered with foil. Fluff with a fork and serve or let cool and package for the freezer. Makes about 1 pound 4 ounces or 3 cups of cooked rice. Here are the directions for white, brown or brown/wild rice mixture. THESE DIRECTIONS ARE NOT FOR INSTANT RICE PRODUCTS. Combine rice and 1 ½ cups water or broth in 1 1/4 quart stainless steel bowl. Cover tightly with aluminum foil. Add cooker lid, put on weight, bring to 15# pressure. Time for 5 minutes, lowering heat to keep pressure weight just jiggling. Makes about 1# 1 ounce cooked rice or 3 cups. Time for 15 minutes, lowering heat to keep pressure weight just jiggling.